Obviously, renting movie from iTunes will be much cheaper when compared with purchasing. 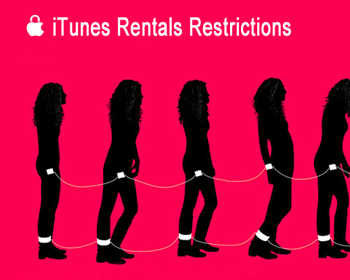 But there are many restrictions and inconvenience in iTunes rentals. In this case, you will need to remove DRM from iTunes to get rid of all the restrictions. This guide will show you what restrictions you will encounter with when renting movie from iTunes and how to remove iTunes DRM restrictions so that you can be free from the restrictions and keep iTunes rentals forever. >>Rental period restrictions - Once starting playback movie, you will only have 24 or 48 hours for watching. iTunes movie will disappear when movie expires. It will disappear in 30 days even you didn't take a glance at the movie. >>Playback device restrictions - You won’t be able to enjoy it on your android, windows 8 or any non-iOS devices. You can’t enjoy the HD movie rentals even you are old Apple user that own iPhone 3 or previous, iPod Touch 3th generation or previous. And 1080 P is only playable on iPad (3rd generation), Apple TV (3rd generation), and Mac or PC. >>Media player restrictions - You won’t be able to play your movie rental on your computer with VLC, Windows media player or other video player without the large iTunes program if you are Windows users. >>Movie storage restrictions - The movie can only exist on one device at a time. Once transferred, the movie will disappear from your computer's iTunes library. You need to transfer movie every time if you want to change a device. You can’t watch your movie rental conveniently even you are the Apple super-fan who own all the Apple products like iPad, iPhone, iPod, Apple TV and Mac. >>System requirement restrictions - iTunes 10 or later is required to rent movies on your computer. iOS 3.1.3 or later is required to rent movies on your iPhone, iPad, or iPod touch. You can not play movie with older system. Actually, apart from the 1080p issue, all of the restrictions above are caused by DRM protection. In order to free yourself from the iTunes rentals restrictions, it will be necessary to remove DRM protection from iTunes rentals. How to Keep iTunes Rental & Get Rid of the Restrictions? Remove DRM from iTunes movie rentals & purchases. 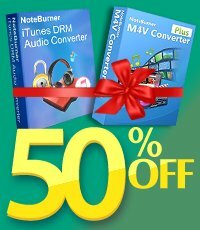 Convert iTunes M4V to plain MP4, MOV, FLV, AVI, MPEG. Keep all subtitles and all audio tracks, including AC3 5.1 audio track. Fully customizable output profiles for any device. Export lossless movie file with unmatchable quality. Free you from all the iTunes rentals restrictions. 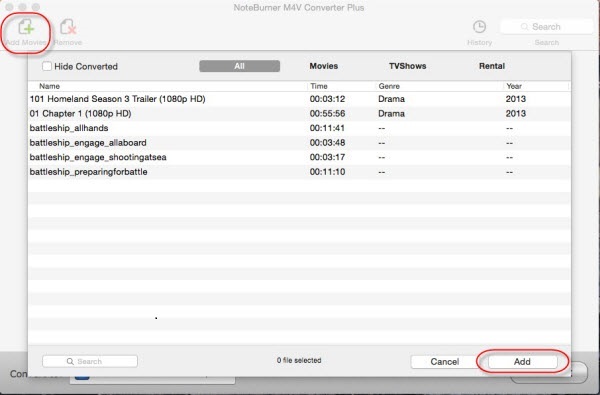 Download and install the NoteBurner iTunes Rentals Converter on your Windows or Mac, then click "Add movies" button on the top-left to choose the content you want to convert from iTunes library. After that, click "Add", the files will be successfully imported. To get better quality and conversion speed, you can simply click the format bar and choose "Same as source video for mp4" from the profile list. The quality of the output video will be lossless. 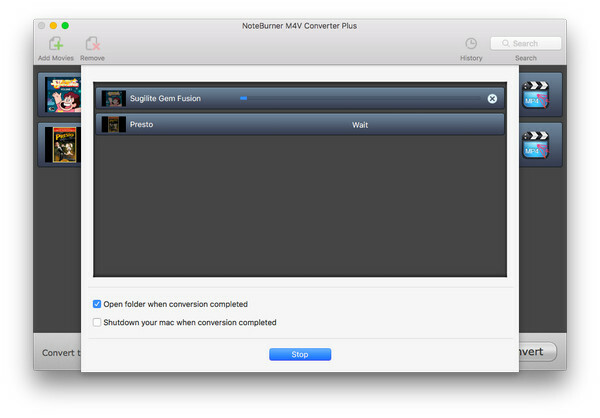 Click the "Convert" button at the bottom of the main interface and start to convert iTunes rentals to normal MP4 video. 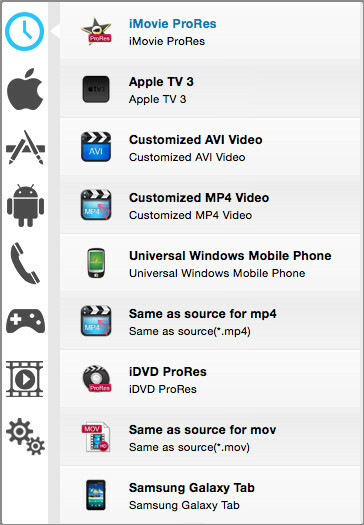 When the conversion finishes, iTunes rentals are no different from other local video files. You can keep them forever and play them on any devices. Video Tutorial: How to Remove DRM from iTunes Renatls and Purchases?